Note to prospective graduate students: As a Professor Emeritus, I no longer have an active research program at the University of Maryland. Therefore, please do not send email asking for consideration as a Graduate Research Assistant. Academic Degree: MS, Ph.D., Cornell University , 1969, 1971. BS, Mathematics, Rensselaer Polytechnic Institute, 1967. Professor Emeritus, Computer Science and Institute for Advanced Computer Studies. Senior Research Fellow, Fraunhofer Center Maryland, Chief Scientist, 2003-2007; co-Director, 1998-2003. Editor, Advances in Computers, , Academic Press - An imprint of Elsevier Science, 1993-2011. Editorial Advisory Board, J. of Computer Languages, Systems and Structures, 1980-2010. Editorial Board, Empirical Software Engineering Journal, 1995-2011. Local Arrangements, International Symposium on Empirical Software Engineering and Measurement, Baltimore, MD, October 2013. Program Committee, International Symposium on Empirical Software Engineering and Measurement (ESEM 2007), Madrid, Spain, September 2007. Program Committee, International Symposium on Empirical Software Engineering, Rio de Janeiro, Brazil, September, 2006. Program Committee, International Symposium on Empirical Software Engineering, Noosa Heads, Australia, November, 2005. Program Committee, 11th International Symposium on Software Metrics, Como, Italy, September 19-22, 2005. Program Committee, 10th International Symposium on Software Metrics, Chicago, Ill., September 11-17, 2004. General Chair, International Symposium on Empirical Software Engineering, Redondo Beach, CA, August 19-20, 2004. Program Committee, International Symposium on Empirical Software Engineering, Rome, Italy, October, 2003. Program Committee, 9th International Symposium on Software Metrics, Sydney, Australia, September 3-5, 2003. Program Committee, International Symposium on Empirical Software Engineering, Nara, Japan, October 2002. Program Chair, International Symposium on Software Metrics, Bethesda, MD, November, 1998. Program Chair, International Conference of the Chilean Computer Science Society (SCCC Conference), Valdivia, Chile, November, 1996. Program Co-chair, 18th IEEE/ACM International Conference on Software Engineering, March, 1996, Berlin, Germany. Chair, IEEE SoftFair II Conference, December, 1985, San Francisco, CA. Understanding how organizations, such as NASA e.g., NASA/GSFC Software Engineering Laboratory, develop and understand new technology. How one experiments to validate software engineering claims. Experimentation and data collection are becoming accepted practices within the software engineering community in order to determine the effectiveness of various software development practices. However, there is wide disagreement as to exactly what the term "experimentation" means in this domain. It is important that we be able to understand this concept and identify how we can best collect data needed to validate software methods that seem to be effective. This understanding will provide a basis for improved technical exchange of information between scientists and engineering within the software community. Security depends upon not only implementing effective security policies, but also implementing standard algorithms correctly. Most security flaws (e.g., viruses, worms, trojan horses) are not the work of poor algorithm design, but of garden-variety poor programming practices and validation. We are working on evaluating software testing processes that can better detect potential security problems. Programming Languages: Design and Implementation, Fourth Edition by T. Pratt and M. V. Zelkowitz, Prentice Hall, Upper Saddle River, NJ, (2001) ISBN 0-13-027678-2. This is the fourth edition to this sophomore/junior level textbook which describes various programming languages from the point of view of the underlying implementation of those languages. This fourth edition updates the 1995 edition with anintroduction to the World Wide Web, including Perl, Java, HTML, and short introduction to cgi scripts. 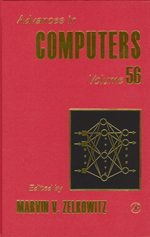 Advances in Computers Edited by Marvin V. Zelkowitz, Elsevier Inc., Volumes 40-83 (1995-2011). This is the longest continuous published anthology of computer science articles. Each volumes contains from 5 to 7 in depth articles about current topics of interest. (Chapters published from volume 46 (1998) through volume 83 (2011)).